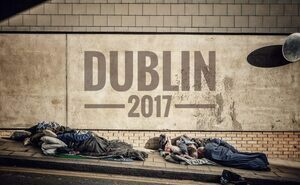 Meanwhile, at the back of Stephen’s Green Shopping Centre [Dublin 2] aver the weekend..
Posted in Misc and tagged Donal Moloney, Homeless at 10:14 am on October 2, 2017 by Donal Moloney. I’ve really started noticing this lately; homeless people aren’t hidden away anymore, there’s no space left to hide them all away. They’re sleeping all over the place, in plain sight now. Hopefully this will make it very difficult for people to continue ignoring the problem. You really think people are ignoring the problem? What do you suggest “people” should to fix the problem? There wouldn’t be enough to go around. You just create another need then. As Gorev said, build social housing. Ah, in that case Im sure this photo will help enormously! It won’t help with people who have your kind of attitude, but it might help with people who actually care about their others. No it wont. Thats the problem with you and your ilk. You think a photoshopped image will actually help build social housing. Pure laziness. Thats why you stand idly by and complain- I tweeted! Why are the refugees not sorted!! 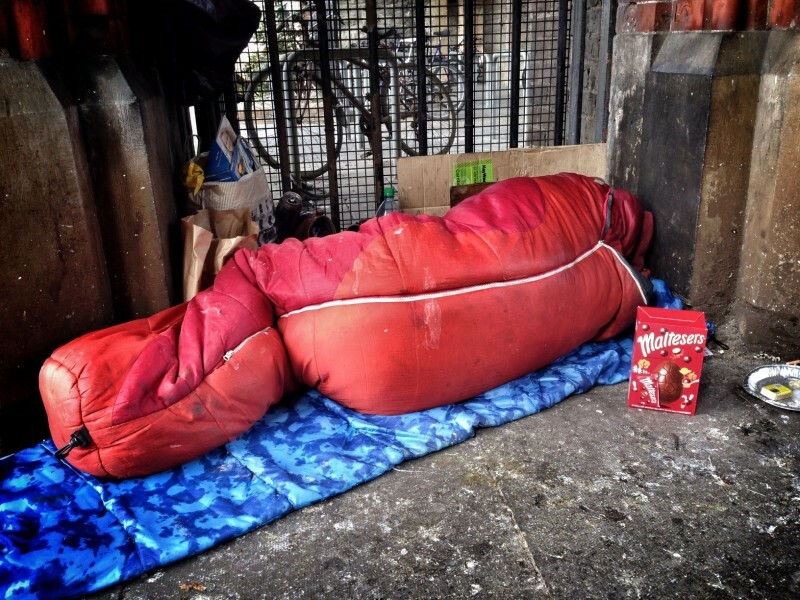 I liked on FB- why are there homeless on my streets? I commented on BS- why aren’t there more handouts for me! And what exactly are *you* doing to help besides making angry comments at nice people who want to help? I am helpfully pointing out the error of your ways so that you can learn from my wisdom, you angry little ingrate. Hmmm. Can’t tell if you’re trolling or completely delusional. I’m going with option B after your tantrum about ‘”those who wish to defeat you”. That was hilarious. You little right wingers with your impotent rage are pure entertainment. My dear boy, dont confuse my jolly red faced jowls (too much claret and grouse) with the anger of your youth. I had time for that once, but saw the pointlessness of rage and learnt the grace of gratitude. I feel lucky to be in Ireland, thats the source of my joy. I don’t share your hatred for our home. Stop voting for parties that think homelessness is a price worth paying for revering the sanctity of the ‘free’ market, which is anything but. Better than locking a Minister in her car anyway. I wouldn’t make my worst enemy sit in a car surrounded by armed police for 20 minutes. The horror! At least that worked. It takes some courage sometimes Moyest, Something your snowflake generation has yet to discover. Until you do you will continue to “like” pictures like the above and think that your job is done. Except you of course. You’re the real warrior. You come on here and stick it to the man doncha!! You’re all talk with your bagful of isms… the moany, privileged boo boo, giving out about everything while living in the top 10% of the world. Taking offence on everything, on behalf of everyone. grow a pair and do something that actually makes a difference to someone other than yourself. You are the Kardashian of caring. Ubiquitous but useless. Oh you mean the generation that took in all the immigrants, legalised gay marriage and equalised rights with women. That generation? All while building a country, making peace in the north, making our place in Europe and making sure there was dole for moaners like you and Moany Moyest Mc Moyestface? Not poor. I live in one of the riches countries in the world. I *literally* lol’ed at that. There’s something cute about your incoherent anger. Ahhh! The ‘or something’ way to sarcastically end a sentence! I’ve not seen that since I was about 16! Thanks for the memories, friend. So obviously very very recently. Child. Creep takes digital camera image of unfortunate souls, denying them any intimacy. The gaudy filters and effects are as crass and tasteless as his eye for a decent digital snap. No doubt his retorts will be as righteous and sanctimonious as usual. Baffled as to why BS continue to indulge him. Must be nepotism…. As if by magic, they’ve let him out!? Donal’s stalker Mr Digs returns. We were wondering where he had gone. Flattered you think of me Teresa. I’m not stalking the man, I don’t think about him enough to do that. When he publicly whores himself on sites that I check in on from time to time, like this one, I feel I have to balance the praise with some truisms. I especially feel this anger when I see how he exploits vulnerable people in order to satisfy his own maniacal ego and moral importance. I find this digital photo makers digital imagery as nauseating as I find his polemic and misguided musings on society. Digs. You’re obsessed with the man. You’re obviously a very unhappy individual. Take Dunphies advice and seek help. Since I don’t recognise any of these names I’m assuming Digs, Teresa and Dunphied are part of some Donal travelling bandwagon sales team. Their infighting would be fierce tiresome. We’ve enough of that going on already. They’ve all re-emerged from the original pigeon post. I like a lot of Donal’s work, not so keen on the rest of it. But I don’t like the commentary he attaches to it. I’m sure, though, he couldn’t care less what I think and that’s fine. Everyone’s happy. I do though think the way comments are dealt with on BS is really, really strange. I queried it once and Bodger said “We’re a bit protective over Donal”. If anyone says anything negative, the comments either disappear very quickly or brand new commenters – Teresa, dunphied, Charlie, for example – emerge to quite aggressively attack the commenter (in this case, Digs). It’s the sort of thing Rajoy would probably be keen on. The way some of you think the comments section has any sort of value to anyone other than the people doing the commenting never stops being amusing. Are you seriously trying to suggest that my comments don’t enhance your life, bringing beauty and wonder? I have drugs for that. Well, I’m here if you need me, pal*. I can assure you sir that you are totally incorrect and a complete idiot. Digs! Seek help before it’s too late. I’m absolutely amazed how BS can put up with your constant negativity and hatred. You have nothing to offer but disdain. I’m not always negative. I like dolphins and three legged dogs. I might even learn to love you in time …. “on sites that I check in on from time to time..” Oh dear! Good lad Digs. Thanks for confirming your stalking guilt. Negative is much too positive a word to describe your sickness. But what if it’s Donal stalking Digs!! If I end up homeless from my poor mental health issues, will you come and take my picture? Can I also observe Dunphied, there’s a certain irony to your tone…. Digs. You’ve been well and truly rumbled. I truly hope BS have the good sense to take some action on your self confirmed stalking and internet bullying. What? Are you all there? Are you stoned or something? Bit schlocky alright – I don’t think subtlety is Donal’s bag. In fairness to you, that pic does look photo shopped or piled with some sort of filter. It certainly is not a random picture by a shocked passer by. It’s not him denying them any intimacy, pet. Don’t feed the troll folks. I agree with aspects of Digs assessment. People taking images of the homeless, which highlights the issue of homelessness and promotes the photographer at the same time. Hmmm, a quandry. Also, there is something that bothers me about the filters and effects this particular photographer applies to his photos. Perhaps, in this instance, it is fetishizing their suffering for the sake of, ahem, ‘highlighting the issue’. OK, To be honest, this is a dodgy comment, not fully thought out. I haven’t quite found the correct words to describe my unease. But I thought I should pipe up, considering these new BS visitors who have suddenly appeared, jumping on Digs. Though Digs hasn’t been around for a while either, so… blah. Homelessness, addiction and poor mental health have never before been so part of mainstream discourse. Should these issues be continually highlighted in a bid to influence and affect public policy and garner greater understanding and actions? Of course, absolutely! 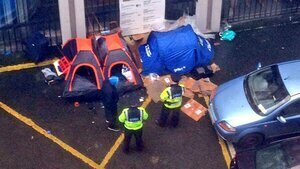 My issue isn’t with the subjects of this digital picture, I also see sleeping bags on the streets regularly and feel great empathy. My issue with is with this particular sort of narrative and framing (no pun intended) and I’ve made clear my why. And yes it does go back to the pigeons. I see and agree with you quandaries. Yet, you appear out of the woodwork and attack this man personally every time BS posts something despite 90% of the his stuff they post has absolutely nothing to do with homelessness. You’re a sick nasty piece of work. Apparently internet bullying is now(or soon to be) a crime. I truly hope BS point them in your direction. I don’t rate his work or his character. When one puts their work into the public domain, he/her and their followers have surely got to deal with the dissenters as well as the fans, no? And to suggest bullying is a real leap of the imagination. As of yet, I have not persued Donal on his Twitter feed or his Facebook account. I have not gone to his website and I have not texted him. A true bully would have persued him with proper enthusiasm. I personally would not approve of that kind of behaviour. While I do not post on BS with the same fervour as I once did, I could hardly be described as coming out of the woodwork. Again, there is a certain irony to your tone. Look carefully and you will find it…. “his character” You’ve met him? haha.. you don’t know what the word ‘bullying’ means. Charlie, I don’t stalk, troll or bully for a living. That is a childish assumption. Actually apart from Katy Hopkins I can’t think of anyone who gets paid to do that. No, what I do (not that it’s any of your business) is quite the opposite. I’m too humble and modest to bore you with the specifics. I’m not as self indulged as someone else I’m thinking of… But I suppose self praise isn’t really any praise at all. Regarding Donal Baloney’s character, no I’ve not had the pleasure of meeting the man. I have come to to my own conclusions on his character based on comments he has made, based on his own verbal narratives of his own digitally enhanced images, based on the odd interview his work led me to and based on his digital imagery itself. I’ve not met President Trump, but I feel I have some insight into the character of the man without having met him. Of course, I’m not suggesting Donal is like Trump. Donalsbis much more handsome in my mind. So you’ve never met the man, yet you’ve got him all worked out. You namecall(like a child), insult him at every opportunity and stalk his every post on BS. Be a man by doing yourself a favour and go meet/contact the man. You’ll not meet a nicer more genuine guy. Think of it as therapy. I contacted Donal once through FB and received an extremely curt reply: “Sorry, I’m not into that sort of thing”. I don’t think he’s as open as you’re suggesting. I’ve also contacted him a couple of times and he’s been more than helpful. The mind boggles as to what you requested. Very approachable. Digs. You are obviously totally unaware of the good this man has done(and continues to do) with certain parts of the homeless community over the last few years. Most is not even documented. You really haven’t a clue and if you bothered to rather than just hatin’ on the guy you might just find it educational. Good question Charlie. So Digs, have you ever met Donal? I’m just glad they finally stopped posting leather jacket guy and Johnny bs. That was some tripe. it depends on your definition of ‘new house’. 15,000 are newly connected to ESB. So this number includes new builds, but also refurbishments [to be fair this also includes existing houses that got a new extensions and needed a new connection]. my only want from BS is to engineer a war of words between Terry McMahon and some of Donals supporters. Then I shall be thoroughly entertained. Yes, it was very good, wasn’t it?! Which was your favourite bit? I liked when one of Donal’s fans said, “He does a lot of good work for the homeless… some of it not even documented”. Hate that too when you take a great shot only to find the fupping lens cap is on. that would be a tragedy that only Donal could understand! My fav part(that everyone overlooked) was Digs stating “As of yet I have not pursued Donal’s twitter feed or Facebook account”. As of yet? I bet he’s been all over that for a quite a while now. He also checks his work out from “time to time” on “other sites”. The sooner BS wise up to this angry stalkers antics the better.